Many men may be hesitant to trust a no-name brand that they don’t recognize, so that’s why they’ll appreciate the Remington BHT600 Body and Back Men’s Groomer. 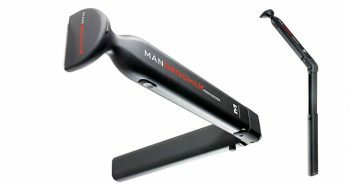 This is a men’s personal hair trimmer that will help rid them of embarrassing body hair. Best of all, Remington has a trusted name for men’s and women’s shavers, so men will feel confident in making this purchase. This groomer is narrow and has a metal comb at one end. 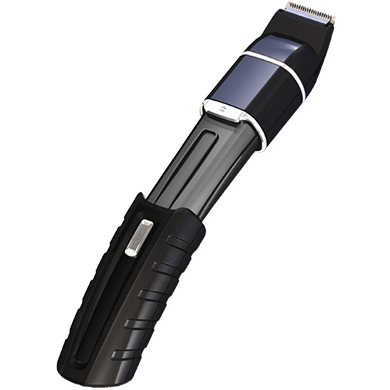 The groomer is black in colour, and has a sliding button so it slides open, making it much longer and easier to hold in your hand. The extendable handle will help you to use it on hard-to-reach places on your body, such as the middle of your back. You can use this groomer to shave your chest, back, arms, legs, and other areas. The Remington BHT600 Body and Back Men’s Groomer can actually be used wet or dry, so you can get a better shave in shower or bath. It can be used with men’s personal grooming products, such as gels, lotions, or creams. Since it’s waterproof, it’s also 100% washable, so you can get out the tiny hairs and lotions from the inside. You can also remove the attachments to rinse them off. Built within the head of the groomer are bi-directional blades and they can shave whether you are moving it backward or forward. 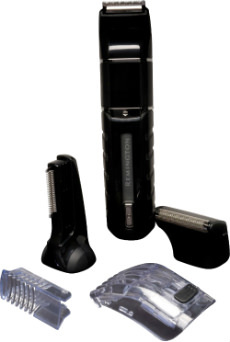 The blades built within this shaver are titanium-infused, making them stay sharper for longer. 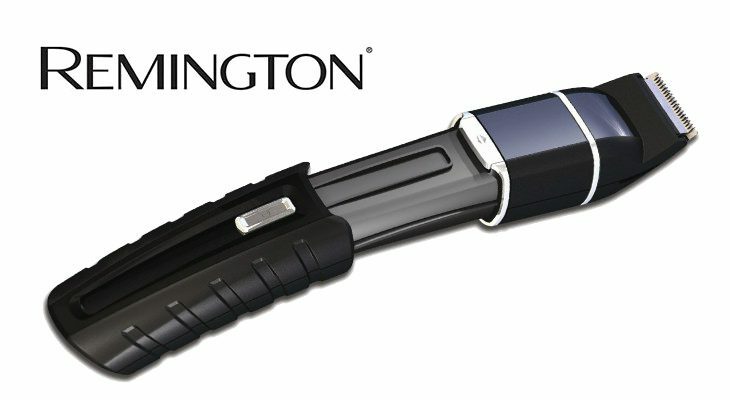 The motor of the Remington BHT600 is high-efficiency, minimizing the effort that you need to shave. Shaving time will be lessened, which is valuable, as men with body hair will need extra time in the shower to shave it all off to look their best. This shaver is cordless and rechargeable. It will be easier to shave in the shower or tub, and you can even pack it into your luggage to take on a trip. You’ll be able to shave at your convenience, instead of needing expensive hair-removal salon services. 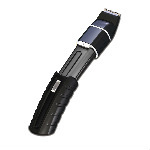 It also comes with extra accessories, including an extra-wide vertical blade, to extend the purpose of your groomer. There is also a power adaptor and a travel case included. The Remington BHT600 Body and Back Groomer comes with a two year warranty. The package measures 2.5” x 5.8” x 10.1 inches, and weighs 1.4 pounds. This Remington BHT600 hair groomer costs around $40, making it an affordable second purchase for a men’s body shaver, particularly when your regular men’s face shaver can’t do it all. The Remington BHT600 Body and Back Men’s Groomer will make your personal grooming chores much shorter in the shower. 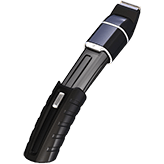 You’ll also appreciate how you can pack it into your luggage, which will give you several shaves on your trip, without having to pack the charger cord, or worry about universal voltage. 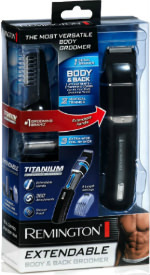 The ratings for the Remington BHT600 Body and Back Men’s Groomer are generally favourable, at about 3.5 out of 5 stars. Keep in mind that it’s a budget hair groomer, not a premium model. Some of the issues may be with the failure of the motor. The product is backed up by a manufacturer’s two year warranty, so it will be replaced if there is a failure with the product. 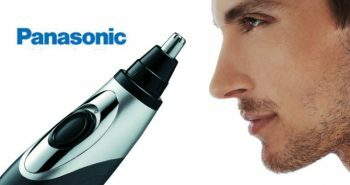 Since men’s shavers are subject to mechanical failure it can be difficult finding a reliable model. With Remington, you can trust that you’re getting the best for your dollars, and if not, you’ll still have the two year warranty to fall back on.